The scale of the UE Roll means bass isn't massive, but even so it lives up to its "Ultimate" namesake in delivering clear audio from a good-looking design with stacks of features - from waterproofing to a sturdy bungie cord for hanging the product in more creative positions. Few budget offerings can compete with that. We've been suitably impressed by Ultimate Ears' range of Bluetooth speakers, from the UE Boom to UE Megaboom. The company's latest, the UE Roll, is a mini-discus-shaped portable speaker with typically colourful Ultimate Ears style, but with the addition of full-on waterproofing. Although the Roll isn't as ear-stompingly loud or bassy as the pricier UE Megaboom, it's the perfect partner for a summertime pool party without the fear of it sinking to a watery demise. Its IPX7 rating means it can officially sit at a metre depth for 30-minutes. The UE Roll also has a bungee cord built-in for strapping it to, well, pretty much anything: attach it to your bike's frame; sling it to the outside of a bag; wrap it around a lamppost; do as you please with this fun portable. It's certainly versatile, then, but at this smaller scale can the UE Roll deliver ample sound to make it the perfect affordable Bluetooth speaker? We've been living with one for a month to find out. The UE Roll is a wholly different take on the usual mini Bluetooth speaker, with its dinky dome-shaped design showing a more fun form than the norm. Take one look the UE Mini Boom, which the UE Roll effectively kicks out of the Ultimate Ears line-up, and the difference between the two is clear: the Roll doesn't look like one of those ten-a-penny industrial speakers. But the Roll has not been designed in such a fashion for the sake of it. The curved dome, which measures 135mm across the diameter and sits 40mm upright, is there to fling sound out through 360-degrees. Assuming, that is, the product is laying flat on a surface or pointing at the listener, as – and unlike the UE Boom – from behind the audio distribution is more limited, with the high-end diminishing. In terms of functionality the UE Roll keeps everything wonderfully simple: giant plus and minus symbols on the top of the product control the volume, while the power on/off and Bluetooth sync buttons are tucked away underneath. No unnecessary complications here. Setting it up is as simple as removing it from its single sheet origami-style poster wrapper. Switch on, sync with a Bluetooth connection in seconds and you're good to go. There's also a dedicated UE Roll app which adds equalisation presets and custom adjustment, the ability to pair another Roll in a stereo sequence, setup an alarm, and tweak various settings such as the speaker's name. To recharge the battery there's a luminescent Micro-USB-to-USB cable included (no mains plug here), or for those looking to wire solution a 3.5mm jack under a flap to the rear covers that base (albeit not with full IPX7 waterproofing due to exposure). The flap is a bit fiddly, but that's part and parcel of a weather-sealed product. We've had the UE Roll for a long time, having collected one from Logitech's HQ back in June. We saw, heard and learned plenty of exciting things on that visit (follow the link below for more), but the real test comes in the proper real-world listening. And we've avidly been throwing all kinds of genres at this little speaker to see what it's got to offer. 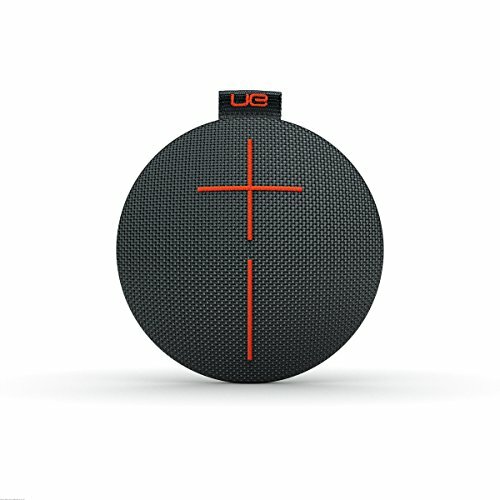 Given the scale, the 2-inch driver inside the UE Roll doesn't deliver chest-rumbling bass, but that's to be expected. With a low-end best of 108Hz, it's not going to even nearly output the kind of sub-60Hz sub-bass you'll get in some underground music, but it's more capable than the 135Hz low-end limit of the now-defunct UE Mini Boom. But we doubt bass-laden underground music is what the Roll will be presented with most of the time. Choose some pop music, which is designed with a wider variety of speaker systems in mind, and there's plenty of punch. We're not just talking Britney Spears either, as even the lead bassline in Drake's Started From The Bottom just about pushes through. Sure, so it's not as giant as on our Mordaunt Short setup, but for the UE Roll's expected £89 asking price it's a balance of expectation. Kick drums pop, the twin 3/4-inch tweeters always deliver sparkling high-end, and there's plenty of mid for vocal clarity. From Deftones to Leonard Cohen, and Chelsea Wolfe to Bjork (yeah, we've opted for a sombre midsummer soundtrack!) the guitars, strings and vocals all soar. It's decent from a speaker so small. If you don't like what you hear then make some manual tweaks in the custom EQ within the app. The +/-6 available across five well-considered frequency bands can make the world of difference, which we've been using to extract some added pop from The Chemical Brothers' latest, Born In The Echoes. We've found the connectivity range to be decent too, although the supposed 65-feet Bluetooth range is subjective depending on where you happen to be. A signal from a phone didn't do a great job of penetrating the walls of our 120-year-old house to make it into a second room, for example, but in the garden there were no such issues. Battery life can live up to its 9-hour life no problems in the office, but crank the volume up – as you might when outside – and that time will, naturally, dip. When it comes to affordable Bluetooth speakers there are so many options on the market, so standing out is important. Which is exactly what the UE Roll does: it's colourful and distinctive discus-like design is eye-catching, while sound output is quality for a wide range of music. Expect to have huge chest-rumbling bass at this price point and scale and you might be disappointed, though, but there's enough punch and pop to please. At this scale – and given with waterproofing, a genuinely useful app (it's non-essential if you don't want to use it), and that bungie cord for more creative positioning – there are few other feature-packed and affordable Bluetooth speakers that can compete with the UE Roll.